Instead, with the Birds struggling on offense for most of the first half and nursing only a 3-0 lead at the 2-minute warning before halftime, it looked more like the visit from the winless Niners would end up a trick instead of a treat. But this is not your father’s Eagles team (or any Eagles team from the recent past for that matter). A team that had actually lost four of its last six games when they were favored by double digits has now learned how to win even when they are facing an inferior opponent. 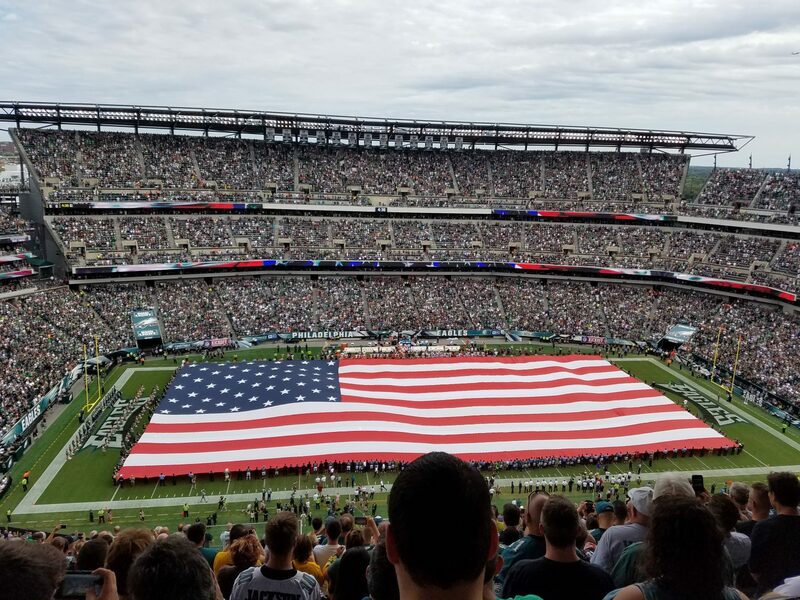 Before the fans even had time to contemplate whether to stand in line for crab fries or nachos, the Eagles scored two touchdowns in the last two minutes before halftime to turn a nervous 3-0 lead into a 17-0 comfortable one. All the treats continued in the 2nd half, as the Eagles built a 33-7 lead with ten minutes left in the game, resulting in the fans heading for the exits before the rain, which was off and on during the game, finally began to get heavier and continue through the night. But while the skies looked quite gloomy overhead, and over the rest of the 49ers season, there was nothing but sunny skies for the Birds at the halfway point of their 2017 campaign. To their credit, the team did not go into the locker room with any bombastic swagger. They knew they had won only because they were facing a winless team that they allowed to hang around in the first half. San Francisco was the team of the decade in the 1980’s and was once a model franchise that others, like the Eagles, sought to emulate. But in their current state, they are a wretched team that is at one of its low points in their 72-year history, which explains why they just traded a 2nd round pick in next year’s draft for Patriots backup quarterback Jimmy Garoppolo. Speaking of trades, the Eagles pulled off one of their own as well before Tuesday afternoon’s NFL trade deadline, sending a 4th round pick to the Miami Dolphins for running back Jay Ajayi. The trade for Ajayi is another smooth move by general manager Howie Roseman, who seems to have a penchant for fleecing the Miami Dolphins whenever possible. It was Howie, after all, who engineered a trade before the 2016 season to move up from 13th to 8th in the NFL draft, which was later used to move up to the 2nd overall spot to draft Carson Wentz. Ajayi was a Pro Bowler last season, but he fell out of favor with Miami’s head coach Adam Gase, and the one worry with him is that he tends to pout when he doesn’t get the ball, even after games when his team wins. One would suspect that in the Eagles locker room, such a disruptive attitude would not be tolerated. The Eagles do seem to be a very unselfish team, which is a rarity in this day and age of big contracts that are earned based mostly on stats. But perhaps Ajayi realizes that he has a chance to win a Super Bowl here, and could be the focal point of the running game in the future with LeGarrette Blount unsigned beyond this season. Either way, it is currently a crowded backfield, with Ajayi, Blount, Wendell Smallwood, and Kenjon Barner all at the running back spot. Most likely, it will be Barner as the odd man out, who will be mostly relegated to the punt return duties with the addition of Ajayi. As for the team, they have the Denver Broncos at home this Sunday before embarking on their much deserved bye week. The Broncos started the season 3-1, but have since lost three in a row to fall to 3-4 and currently sit 2.5 games behind the division leading Kansas City Chiefs. Along with their current losing streak, the stock of their quarterback, Trevor Siemian, has concurrently fallen as well, and Siemian was benched this week in favor of backup Brock Osweiler. The Broncos have outgained their opponents in all four of their losses, but turnovers continue to kill them, as Siemian has thrown 10 interceptions on the year, including three last week against the Chiefs. Last Sunday, the Eagles faced a 49ers quarterback (C.J. Beathard) that would never be confused with either Joe Montana or Steve Young. This week, they will face a quarterback (Brock Osweiler) that would never be confused with John Elway or Peyton Manning. As such, it is another chance for the defense to tee off and pad their stats, before taking a week off to tee off at the golf course. This entry was posted in Eagles, football, NFL, Sports, Uncategorized and tagged brock osweiler, carson wentz, crab fries, Denver Broncos, howie roseman, jay ajayi, legarrette blount, rice-a-roni, trevor siemian. Bookmark the permalink.